Without taking anything away from the experts who have filled my blog with their thoughts on the topic, I now want to make perfectly clear my position on male enhancement: The field of collective leadership needs it bad, especially the non-profit/social-change sector. I love working with collective leadership programs, and I am fortunate to do so regularly. The recipe for this work adapts to the participants, but it almost always involves something like the picture at right. See W.K. Kellogg Foundation's Collective Leadership Framework and the D.C. 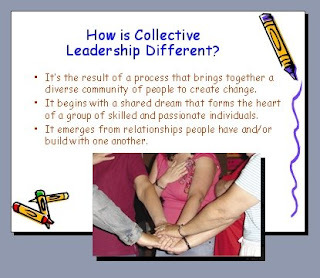 Leadership Learning Community's Nature of Collective Leadership for more. In other sectors, collective leadership draws less with crayons and uses other more dangerous sticks. Speaking of collective leadership in the field of science, John Ziman says that each individual's contribution is "merely a tiny tentative step forward, through the jungles of ignorance." I don't think his savage choice of setting --- where only the fittest survive, thanks to teeth, claws, and other weapons --- was any accident. My Introduction to Web Programming class has filled up again for this fall. It's my personal collective leadership learning lab. How can I equip 75 computer-illiterate college kids with the wherewithal to make their own websites (like these)? I can't. But together, they can. I facilitate my students' learning by dropping them into the Internet jungle and encouraging them to trust their own most primitive hacking instincts. In the spirit of crayons and group hugs, my first gift to my students each term is an online discussion forum where they are encouraged to share anything relevant to the class. Speaking to a ballroom-full of faculty about his experience, Will Mundel noted first and foremost that "Thanks to the online forum we used in CS-103, students stop being individuals in a class. Rather, they are all in it together." I am honored by Will's comment, but that's not the whole story of how my students learn to build their own websites. Underlying the experience of the class is a curriculum I have modeled on the traditional male rite of passage: (1) Throw a boy out of society into the wilderness; (2) Let him suffer and learn; and (3) Welcome the transformed man back into society. (That's my paraphrasing. Here's what the American Psychological Association says about this method of transformational learning.) If you look closely at this gallery of student projects, you'll see a quote from another student that speaks directly to her painful but ultimately victorious journey alone through the wilderness. After subjecting my students to this webified passage of suffering, I top it off with a month-long tournament of hand-to-hand combat. Within the cage of this special-built wiki, the students compete for Google-rank supremacy. This part of the class evolved from my desire to translate the inner workings of the Google centrality algorithm into the real-life experience of the kids. Inviting students into this kind of centrality-based competition is not easy. My first attempt provoked class revolt because students perceived the rankings as an unfair system of grading their work. (The fact that the competition had no impact on actual grades was irrelevant to this revolt.) My second attempt went smoothly: I was careful to provide a fair system for peer reviews in parallel with the same centrality-based competition. With fair peer reviews in hand, the students no longer were bothered by the arbitrariness of centrality rankings. Last spring was my third and by far most successful use of the centrality competition. Not only was there no resentment at the arbitrariness of centrality rankings, but there was a positive embracing of the system. 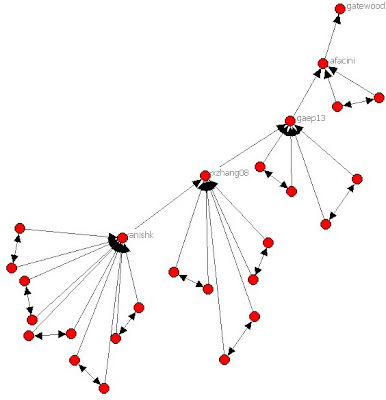 Students discovered how to form alliances and deliberately manipulate the Google algorithm into boosting their own rankings. A flurry of new links and surprise defections preceded the day of our awards ceremony. Three alliances shared top honors. When I refused to award a prize to one of the alliances because their team leader had skipped class that day, his teammates/co-conspirators texted him and made him show up, 20 minutes late, so that they could receive their prize: a one-half of one percent boost in final course grade. The NSF reports today: "The Internet gives scientists and researchers instant access to an astonishing number of academic journals. So what is the impact of having such a wealth of information at their fingertips? The answer, according to new research released today in the journal Science, is surprising--scholars are actually citing fewer papers in their own work, and the papers they do cite tend to be more recent publications. This trend may be limiting the creation of new ideas and theories." This is an argument for Google-induced stupidity that I can agree with (unlike last week's). My only beef with the NSF blurb is the notion that anything "surprising" is happening here. There is plenty of evidence of our lemming-like ways in other contexts; we should expect a human tendency to dive over the cliff of the web's dark side. Here's a first-person demonstration. By doing a bit of Googling I can share the first decent link that pops up to support the claim that humans are lemmings: Conversation, Information, and Herd Behavior, in the American Economic Review, 1995. Using Google in this way, I can feel myself regressing into a rodent even now. One of the first, most famous and shocking demonstrations of human lemmingness was devised by Solomon Asch in the 1950's. Most people after reading this story find it hard to believe that it could happen to them. I had the "good fortune" to be tricked by my college psychology professor into Asch's trap, exposing my irrational lemmingness for all my 200 classmates to see. I have no doubt that I am a weak-willed conformist. This work is licensed under a Creative Commons Attribution-ShareAlike 3.0 License and is copyrighted (c) 2007 by Connective Associates LLC except where otherwise noted.